Choosing to become an independent worker comes with some struggles. One of the biggest ones we have found is finding affordable health care. Health insurance is only affordable with a group balances the average. As an entrepreneur, you will no longer have benefits from an employer. So it’s time to dive into your best options for affordable healthcare. NOTICE: You must enroll during open enrollment in the fall to begin January 1. The only loophole is for “life events (i.e., marriage, divorce, death, baby, adoption and etc. ).” Plan your health insurance transition accordingly. We suggest setting up a meeting with a health insurance broker to help understand all your options and choose the best option for you. These are the options we have come up with. An ACA Group Plan is going to be one of the more affordable options. Outside of a group plan you will pay a high premium if you are making decent or better money (middle-class income). This is likely where you want to start though. The first year will be affordable as you build up your income. High-deductible plans usually have lower monthly premiums than plans with lower deductibles. By using the untaxed funds in an HSA to pay for expenses before you reach your deductible and other out-of-pocket costs like copayments, you reduce your overall health care costs. HSA funds roll over year to year if you don’t spend them. An HSA may earn interest. You can open an HSA through your bank or other financial institution. If this is an option for you, take it! Independent insurance is expensive and confusing. We highly suggest an ACA + Health Savings Account through your spouse’s insurance. This will keep your premium low, while still have all the benefits of a regular insurance plan. It will include the added bonus of the lowest deductible. 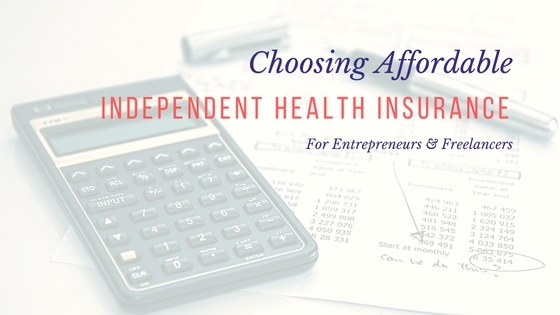 As members of a non-insurance health care sharing, members have an exemption from the federal requirement that they have insurance or pay a penalty-tax. Samaritan Ministries members are a group of believers that have come together in Biblical community to help bear one another’s medical burdens without the use of health insurance. More than 200,000* Samaritan Ministries members share over $25 million* per month in medical needs directly, one household to another, without using health insurance. We suggest setting up a meeting with a health insurance broker to help understand all your options and choose the best option for you. Disclaimer: We are not experts in health insurance. The suggestions above are from countless hours of research for personal reasons. We share in hopes to help others understand their options and make better decisions for independent healthcare.